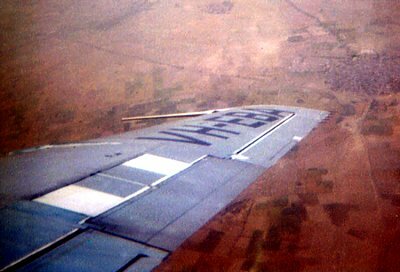 I flew in VH-EBA from London Heathrow to Perth on QF732 on 26 March 1963. I was a very excited 19 year old, emigrating on my own to Australia as a Ten Pound Pom. I hoped one day to learn to fly. I had only £5 to my name, and I worried that I might be charged for excess baggage, so I stuffed heavy objects in all my pockets, including my raincoat. The flight was full, and I was seated on the right hand side just behind the wing. There was a nice blonde girl seated near me but I was too shy to talk to her. When we stopped at Leonardo Da Vinci Airport, Rome all the Italians crowded around her, trying to chat her up. We flew on to Istanbul, which sparkled at night with all the charcoal fires. We also had a good view in daylight of Tehran, New Delhi and Bangkok. The meals were good, and for dinner we had Veal Marsala. We were also given a Crossing the Equator Certificate. Every landing and take off was accompanied by the strains of Arrivederci Roma over the PA, and anytime I hear that song it reminds me of that flight. VH-EBA on approach to New Delhi in March 1963. VH-EBA transits Bangkok in March 1963. We finally landed in Perth on 27 March, late at night. When the door opened, you could smell the bush. The next morning I woke up to a cloudless sky, reached over and turned my transistor radio on. The very first thing I heard was Ted Heath and his band playing Waltzing Matilda. After surviving the coldest winter in England since 1918, I thought I was in Paradise. I eventually obtained my Commercial Pilot’s Licence and flew charter in the Kimberleys, before joining MacRobertson Miller Airlines on the DC-3. 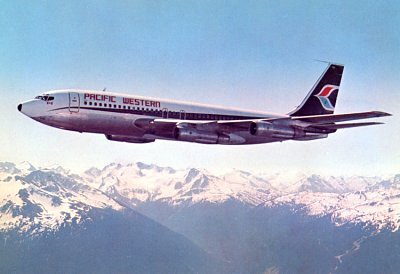 However, in 1967 our course was retrenched, and I travelled to Canada, where I was hired by Pacific Western Airlines (PWA) on the DC-6. After a few years, I progressed to flying the 707. It was during my training on the 707 that I walked through the cabin, which I recognised as being QANTAS décor. Imagine my surprise, when I checked the aircraft log book, and discovered the aircraft was ex VH-EBA, City of Melbourne. It was a dream come true. 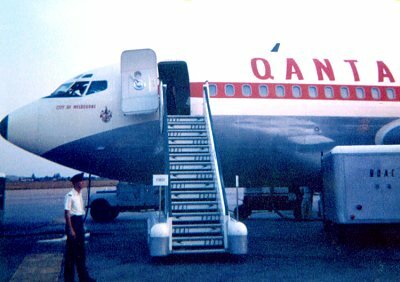 QANTAS had sold the aircraft to PWA in November 1967. The Canadian registration was CF-PWV (later C-FPWV). F/O Charles Page with the former VH-EBA at Keflavik, Iceland in 1974. C-FPWV (formerly VH-EBA) near Vancouver circa 1974. I flew it from June 1972 to September 1974. Our trips took us from Vancouver to Honolulu, Iceland, Greenland, UK, Norway, Denmark, Amsterdam, Jamaica, Bahamas, and Alaska. We also flew the Asian migrants from Uganda to Canada, after Idi Amin evicted them. We were based in Entebbe, and staged through Lagos, Accra, and Las Palmas. If you wrote all that in a novel, people would say that it was not believable. I am now back in Perth, and just amazed the aircraft has been restored and returned to Australia. Thank you to all those involved with this project. This aircraft is an icon, and I look forward to viewing it at Longreach. 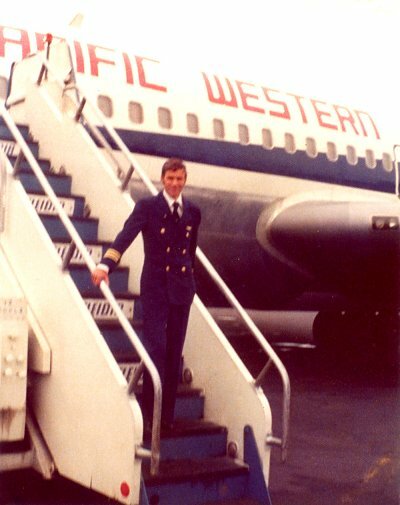 After his stint as First Officer on the 707 with PWA, Charles became a Captain on the Electra and Hercules. His overseas basings included Europe, the Middle East and Africa, especially Angola. After 11 years with PWA he joined Cathay Pacific flying the 707, 747-200 and 747-400. He retired as a 747-400 Captain in 1995 after nearly 17 years based in Hong Kong. He now writes non-fiction, WWII aviation books. Vengeance of the Outback was published in 2002 and he is now working on Wings of Destiny about W/Cdr Charles Learmonth and the air war in New Guinea. All photographs on this page were taken by Charles Page with the exception of the aerial photo of C-FPWV which came from Pacific Western Airlines. All images are linked to larger versions.